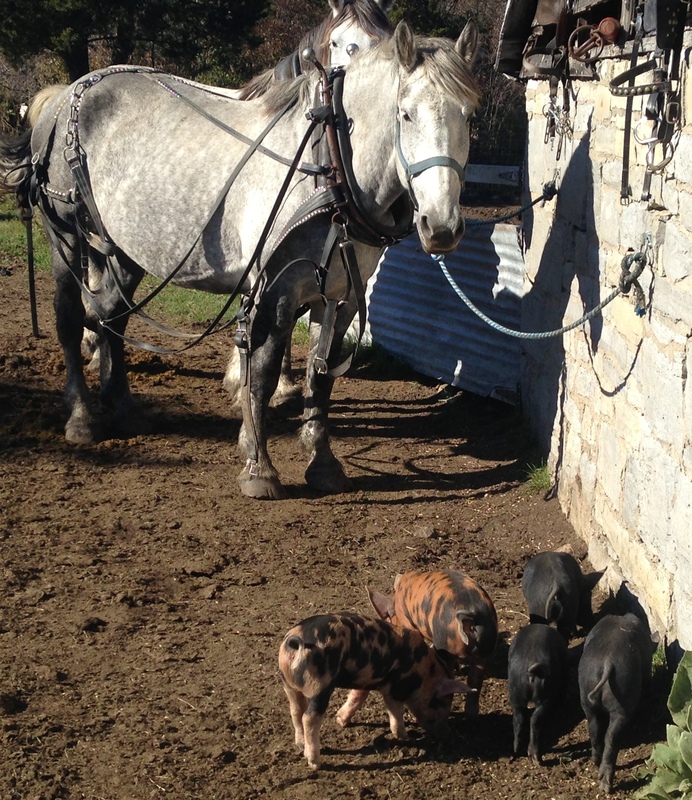 Pigs love to be outside – and that’s how we raise them! They get to root in the earth, eat fresh grass, wallow in the mud, bask in the sun, nestle in straw, and give birth when and how they like. The quality of their diet and the fullness of their life is dramatically evident in the rich quality of their meat. There’s no antibiotics, hormones or any other funny stuff: just a seasonal diet of grain, vegetables, hickory nuts and acorns, apples, grass, and hay. 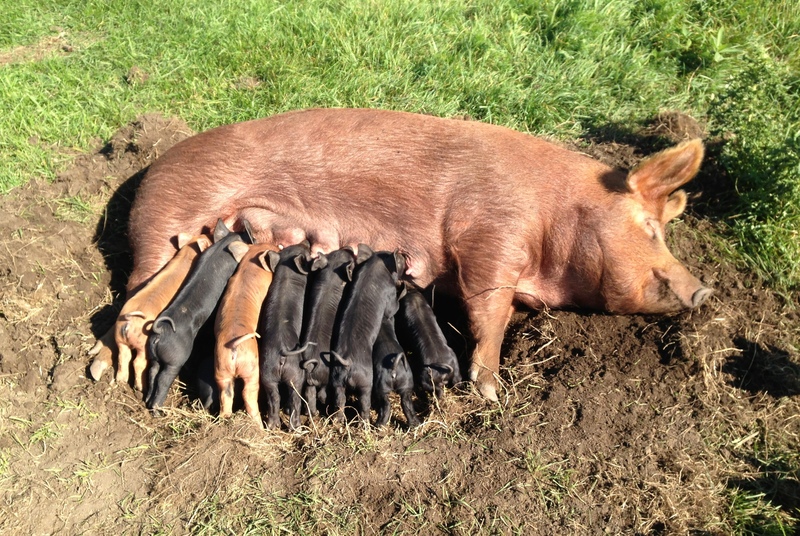 One of our Tamworth sows, Biggie, nursing her litter of 11 out on pasture. Our pigs are sold by the side or whole. The lovely thing about pork is the number of different options in processing: smoked pork chops, hams, sausage, bacon and back bacon are all available as part of your order. We can walk you through what is available, and what is possible for the size of your order, or you can chat with the butcher directly. 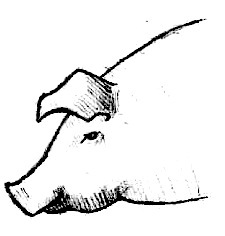 Our pork is sold by the pound @ $2.75/ based on the hanging weight, plus the butchering fees, ($.60/lb), and there are additional fees for smoked products and sausage. We only pass on those costs from the butcher (also note there is HST on butchering fees). The specific figures will vary based on the size of the animal and your processing options, but all in all, that’s how it works. We ask that our customers meet us when we return from the butcher with the frozen meat: you will notice in advance of this date. Your meat will come wrapped and frozen, ready for storage in your deep freeze. Families love to visit our happy hogs. We’ll e-mail you a receipt for your down payment and contact you regarding the specifics of your order. The balance of the purchase is due at pick-up – we will let you know in advance the exact amount. We can help walk you through your basic cutting requests, but you can always talk to the butcher directly. All of our pork is processed in provincially inspected facilities and comes to you wrapped and frozen. Butchering fees are subject to change and HST. Please contact us if you have any more questions!